Veppilai Katti is an unusual condiment, a thick citrus-based paste. It's my favorite side-dish for thayir saadam. I have been craving for it since long... It reminded me wherever I saw lemon leaves or narthangai leaves I used to go around and pick the leaves from various places to make veppilai katti. Veppilai means Neem Leaf. I am not sure as to why our ancestors called this recipe Veppilai Katti when we don’t use Veppilai in it. The veppilaikatti is made by grinding up leaves of citron (narthangai) leaves, karivepilai (curry leaves), and lime or lemon leaves with red chillies, ajwain or omam seeds ,salt, and asafetida. This is ground with the juice of lemons or limes, and salt. The leaves used in this pickle are the tender leaves of lime or lemon trees, and citron (naarthangai) trees, . In this recipe, along with a few curry leaves (kariveppilai) the taste and smell of Ajwain over powers other ingredients and gives the some aroma and taste. Every ingredient in it is raw. There is no oil in it . The end result is a tangy, fragrant, mince that dances in your tastebuds. It enhances the food with an incredible flavor. The pickle is also an excellent digestive-aid.I often used to prepare this recipe in home. But for past two years I didnt get lemon leaves.so I cant able to prepare this recipe. This time veppilai katti brought by my friend from native exclusively for me. My method of preparing veppilai katti. 1.Wash the leaves well, and pat very dry with a kitchen towel. 2. If the citrus leaves are not tender and are a bit tough, remove the hard stalk/vein/petiole in the middle of the leaf. 3. In a dry-spice grinder, grind finely the following together: ajwain, red chillies, salt, and asafoetida. 4. In a blender, dry-grind (no water) all the grind all the leaves till it becomes a moist and crumbly paste. Using a spatula, stir it form time to time in between grinding cycles. 5. Put leaf mixture into a bowl. Add the ground spices, and mix thoroughly. 6. 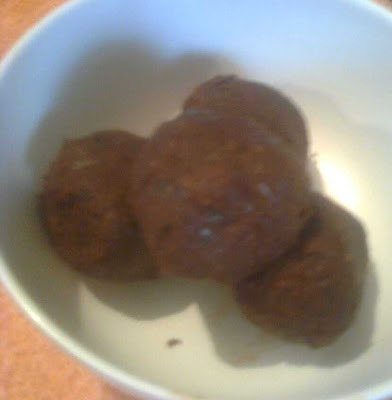 Add enough lime/lemon juice a little at a time so that the mince can be shaped into several walnut sized balls. You may or may not use all the lime juice indicated. 7. Store in a covered container, preferably in the fridge, so that it remains flavorful and moist. 8. Pinch off required amounts from each ball to serve with your curd rice. This is new to me, thanks for sharing! A few years ago I had an orange bonsai tree...My Indian friend told me there is some pickle to make from the leaves.. but it was too late. Since then, I was curious, what is that? Thanks for posting this. I wish I could get those leaves again, this would be a unique taste, and I love curd rice! :) Is this a bitter taste? And, which part of India is this eaten (state, region)? WOw this brings me loads of old memories...My grandma used to do this.. This is absolutely a nice dish to me and sounds interesting. should be trying it soon..
Do take a look at my blog when you find time. Its very new to me never ever hear about this very interesting. I have tasted this but never tried it...thanks for sharing the recipe! Wow! 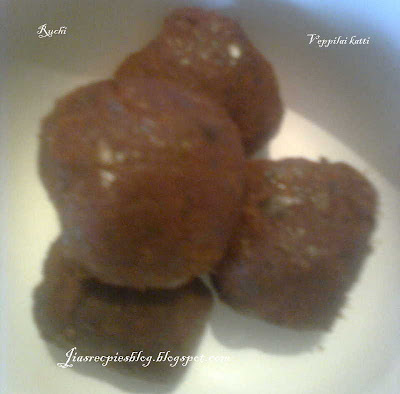 !My hubby loves vepilai katti and we usually buy it from the shops..Thanx for sharing this recipe.. Superb recipe.Lovely blog.Is lime called gadarangai in Tamil.Do let me know.Thanx. v kati very good with wine. I am the only guy doing this i think!? Thank you for your excellent recipe for Veppilaikatti. Your English style is superb--lucid and compact. This Veppilaikatti can be stored in the deep freezer for years and years. I just ate some which had been in the freezer for 10 years. Still tastes fine. good before a cup of strong coffe. Will somebody..ANYBODY..please let me know from where i can buy Vepallaikatti and have them shipped to my address in the U.S.? MY MOTHER MAKES VEPILAI KATTI ALONG WITH OTHER TRADITIONAL PICKLES UNDER THE BRAND MANGALAM PICKLES AT OLD VILLAGE,NEMMARA P.O. , PALAKKAD DISTRICT,KERALA WHICH IS VERY VERY POPULAR ESPECIALLY AMOUNG BRAHMINS.